~ Frodo as Caravaggio’s 1596 “Bacchus”, detail. 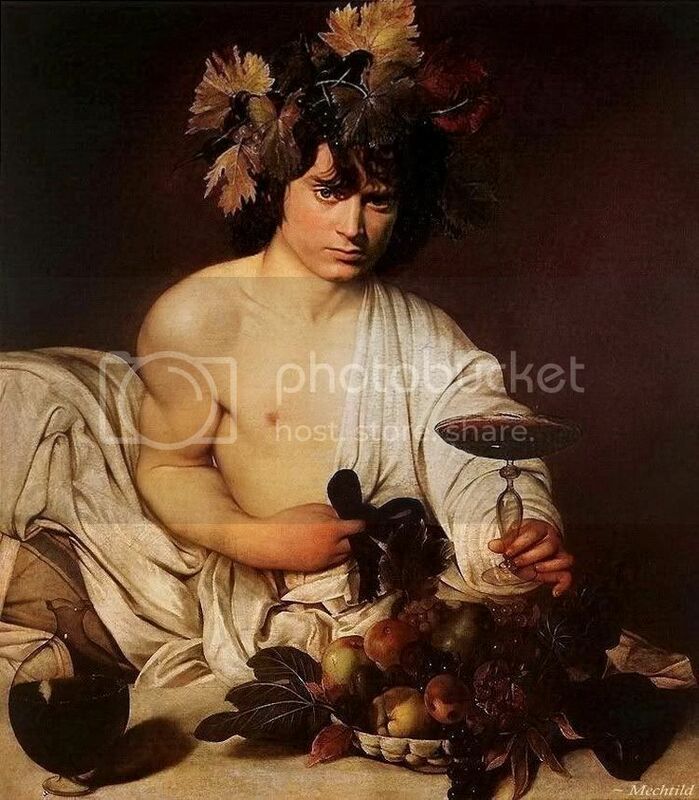 One of the first art manips I ever made was of Frodo as the God of Wine, Caravaggio's "Bacchus" (link to Wikipedia's entry on Caravaggio here). I knew just which face I would use, too: a favourite of mine, of which I had a good copy. I made the manip and was very pleased with the steamy results…. It was a little blurry after I enlarged it, my fledgling manip work with our old program a little crude, but I loved it. I’ve kept it in my “Frodo Art Travesties” online album ever since. While doing so, I discovered a gallery of much, much better images of many of Caravaggio’s paintings. They were clearer, bigger, and the colours much more faithful. One of the images in the gallery was the Bacchus. I was so wowed by how much bigger and better the image was than what I had used, I promised myself then to re-do the Bacchus manip someday. About the painting, the manip, and Frodo. Caravaggio's Bacchus was considered quite innovative in its day. Not only was Caravaggio’s technique astounding his viewers, his portrayal of Bacchus was very unconventional. In his painting, Bacchus is not his usual self: neither lordly nor merrily tipsy, which had been done before. The face of Caravaggio’s youthful god (his model was fellow painter and younger friend, Mario Minitti, who posed for C. many times in the late 1500’s) is a bit flushed, implying more than a few glasses of wine have already been imbibed, but he's not inebriated. He’s wearing one of Caravaggio’s bedsheets, no doubt, the dingy mattress ticking showing from beneath the draperies on the left. His fingers are slender and pointed, but the fingernails (in close-up) are dirty. In spite of his youth, there’s something a little shop-worn about him. The fruit in the basket is beautifully rendered, but it is past ripe and going bad; the vine leaves in the god’s hair are not green but autumnal in colour – a statement about the transience of earthly pleasures? Bacchus’ face is enigmatic. Some have called his look flatly bored, as if proffering the raised glass to the next patron walking into the Mt. Olympus wine bar. I would call the look more introspective, wistful, edging on dissatisfion. I imagine Bacchus looking up, too, but from gazing into the glass he has been turning in his hand, the ripples moving out from the centre of the wine’s surface. His look says to me, “Is this it?” “It” being what makes existence worth while. Now, when I look at my newly-done version of Frodo as Bacchus, with all its newly-revealed detail, and the somber, more restrained colours, it changes the look of the manip for me. My older manip made me thing only, “Hubba hubba! What a dish!” I saw his look as a sultry “Come hither.” Looking at this new manip, I still see Frodo as delectable, but I also see him as someone for whom the party has begun to pall: a god of revelry who has lost his taste for it. He has left the satyrs and nymphs to their revels and retired to a quiet place to get stinking drunk. The redone manip also reminds me of Ian Holm’s portrayal of Frodo in the 1981 radio play of The Lord of the Rings, which ran in 26 half-hour installments (now available in a thirteen-CD set) on BBC radio. It couldn't be more different in mood than Merry and Pippin's boisterous rendition. It's Frodo's accessibility that is the hallmark of Ian Holm’s Frodo. His Frodo is so like us. He has the same sort of emotional frailty we all have, and he scraps for every bit of courage during his ordeal. If Elijah Wood beautifully captures Frodo's otherworldliness, his "Elvish-ness", Ian Holm beautifully captures Frodo's ordinariness, his "human-ness". I love both portrayals deeply. Anyway, Gandalf could not have arrived at a better time in BBC Frodo’s life. 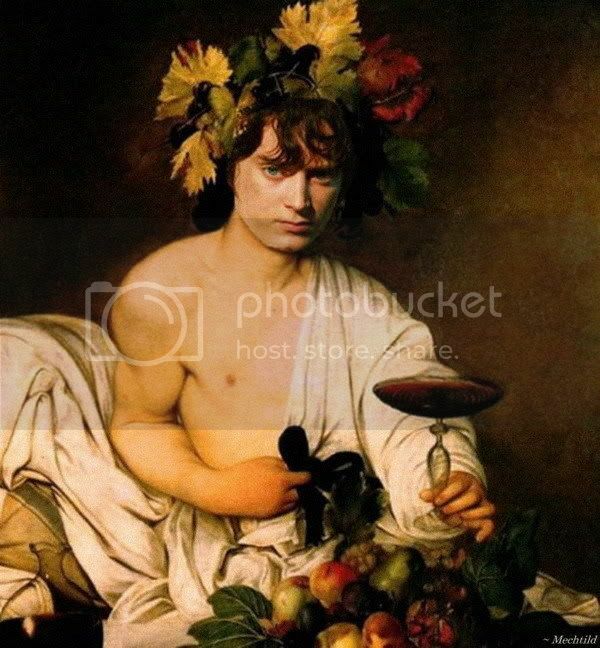 Frodo, like Bacchus in this manip, seems to have reached the point at which he, too, is asking: “Is this, then, it?" Previous Frodo Art Travesty entry ~ Frodo and the Mermaid. Scrapbook Album of all Frodo Art Travesties. Table of LJ Entries featuring Frodo Art Travesties. The new one's really beautiful, Mech! I love the way you cropped the detail on the teaser, too; gorgeous. He does seem to be saying "are we having fun yet?" Poor dear Frodo. I've always wanted to hear the BBC version of the story. One of these days I'm going to throw caution to the wind, and buy it. Can I make just one eensy suggestion? If you give him a little more shadow under his right jaw line, his head might sit a bit more convincingly on his neck. There's just a bit too much light there, and a little dark would cause the neck to receed just enough. I'll give it a try after choir tonight. Thanks for the tip! You did a beautiful job on that! Thanks, Mews. It's nice to hear your feedback, which confirms my feeling that a re-do was worth the while. Yes, his face does have weariness (perhaps reflecting EW's real weariness, since that still is an on-set "behind the scenes" shot). Stunning! The colors are gorgeous, and Frodo's look is so brooding and weary, yet still sultry. If he needs someone to get stinking drunk with, I'll be glad to join him! Wow that is so fantastic Mechtild! You are so fantastic at blending pictures to make them look realistic! Thanks, Alchemilla. Your icon is so cute! Everyone has snowing icons this week, but your monkey sledding is so great, his little scarf flying. Is that Curious George? Oh I remember this manip very well...and what an improvement you have wrought !!! It was good to start with but now it is absolutely FAB !!! Caravaggio is the perfect artist for Frodo paintings, I reckon...his use of light and shadow, and the propensity for using Beautiful Youth models, make them a joy to behold !! Well, you remember how often it was quoted from some FotR reviewer, that EW's Frodo was "like an angel out of a Caravaggio." Stunning manip, Mechtild. And you are right - the newer, "harder" version has an air of sadness, of disillusion... and I never noticed the nearly rotten state of the fruits, and I know the painting quite well. Plus - the face of the original model is nearly childlike; chubby cheeks, a soft chin, big dreamy eyes. Now, with Frodo's/ Elijah's face, it gains some angular grimness that makes the painting seem even darker. Yes, the nearly steely look on Frolijah's face in the manip does change it quite a lot. I never noticed the nearly rotten state of the fruits, and I know the painting quite well. The fruit and the carafe have attracted more scholarly attention than Bacchus himself. The fruit, because of the inedible condition of most of the items, is believed by the more serious-minded critics to signify the transience of worldly things (a variation of carpe diem perhaps). The carafe, because after the painting was cleaned, a tiny portrait of the artist working at his easel was discovered in the reflection on the glass. Wonderful, darling! 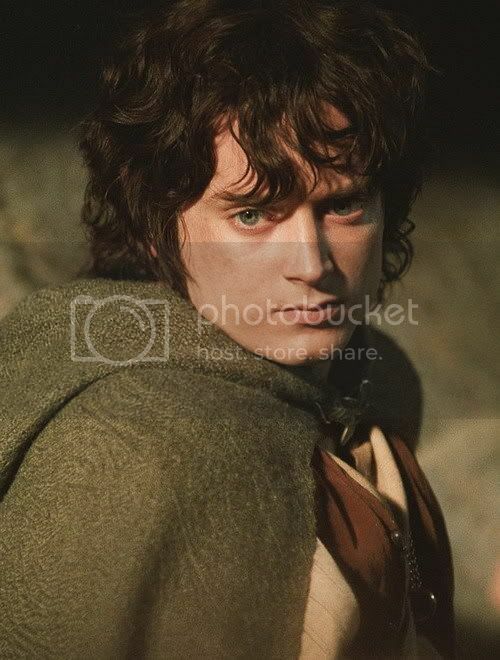 I love the expression on Frodo's face, you perfectly chose the right pic. It makes me want to share some wine (and a lot more) with him! Thanks for this new delicious treat! Oh, Melyanna, thank you. And I love the "Oooooh!" expression on EW's face in your icon. Perfect for your comment! Your Frodo/Bacchus seems to pin you to your seat with an almost challenging look. And what's he holding in his right hand? It looks like he's fiddling with a bow, perhaps from a belt tied around his waist? I think it's probably the tie of a black cord, yes. As for the detail-work, read the snippet I quoted from the Wikipedia sub-article on the "Bacchus", in a reply to Belegcuthalion above. What a shame the copy of the painting isn't bigger still!!!!! I thought your first version was beautiful and didn’t think that it could be improved. Well I’m pleased that I was wrong. This second version is exquisite. So rich and moody. I can almost hear a despondent sigh and a rustling of leaves. Thank you Mechtild for taking the time to bring us such beauty. P.S. All the extra information is greatly appreciated. I'm glad to hear your "second" that it was worth re-doing. Just because it is interesting, I quoted a snippet from a sub-article on the painting in the Wikipedia, which points out that since the painting was cleaned, a tiny self-portrait of C. appears in the reflection of the carafe. What a thrill it would be to find an image of this painting (and all paintings) with THAT sort of detail! There is another, that I know of, where the artist's reflection can be seen in a mirror behind the bride and groom he is in the process of painting. I'll see if I can find it. Oh, thanks so much, Este! 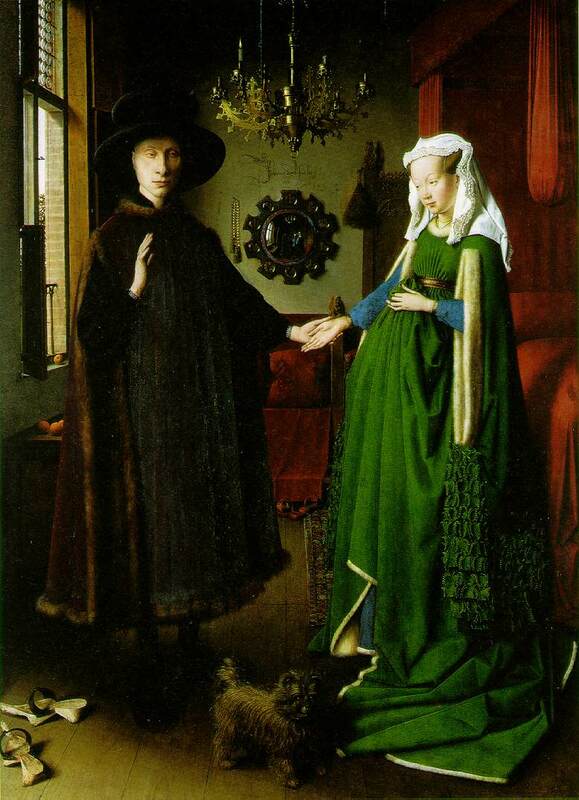 I have seen this Van Eyck before, and have heard there is a portrait in the mirror, but I never ran across a close-up that would show what they were talking about! That is SO cool! In the bio I just finished about Caravaggio, the author maintained that Caravaggio -- who did his apprenticeship in Lombardia in Milan, in the studio of a big artist who was a follower of Titian (this was before C. struck out for Rome, still young and poor) -- admired the work of the painters of the Northern Renaissance. The Flemish painters were known for their fantastic detail-work. Not just their pictures of people, but their landscapes, their interiors, their still life paintings (all those vases of flowers, bowls of fruit, and market or kitchen table scenes!) were greatly admired for their technique. 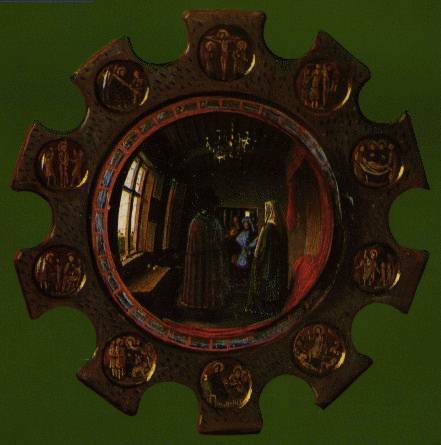 I think they also liked to hide things in paintings, like the images in that mirror. If they did a nativity, they might slip the benefactors into the painting, letting them star as the shepherds or the wisemen; that sort of thing. Maybe Caravaggio got the idea from them? He certainly was noted for his wonderfully detailed still life work, which often was included within his larger dramatic paintings of people. Thank you, Chickenlegs! They do suit each other well.